​Our Round 3 ESF call for projects is now open. Please go to our 'Apply' page for details. ​Our Round 3 ERDF call for projects is now closed. Thank you for all the Expressions of Interest. We will be contacting applicants individually in relation to their meetings with the Panel. 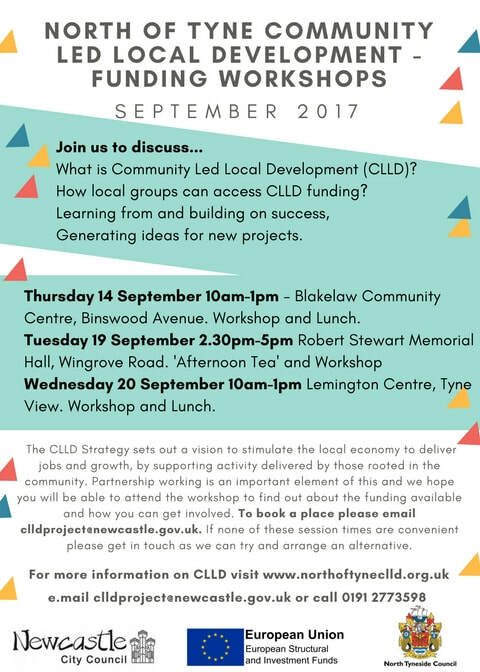 Are you interested in helping deliver the CLLD project in Newcastle and Wallsend? We are looking for new LAG members to get involved with the project in 2019 - check out the JOIN THE LAG page of our website for more information! Today we launched a call for ERDF projects to deliver business support projects to SME's in the CLLD area and help local entrepreneurs explore setting up their own businesses. If you are interested in finding out more all the information and details on how to apply are available on our 'apply' page. Be quick the deadline is Friday 22 of March 2019! Today we launched our 'North of Tyne Employment Pathway' call for projects in partnership with The Energy Academy (Newcastle College) and local employers. If you are interested in finding out more all the information and details on how to apply are available on our 'apply' page. North of Tyne CLLD, Newcastle College and local employers from the energy sector have teamed up to develop a pathway that will support local people into employment. We will be looking for community based projects to support local people to recognise their skills and qualities, feel empowered, build confidence and gain the skills local employers are looking for. We have approx. £23,000 which we hope will fund up to 3 projects. This is a drop session where you will be able to find out more about the application process, timescales and funding available. This is a pilot project for CLLD and through our partnership with the College we are able to provide projects with 100% funding for their activities (i.e. match is not required) . You can join our mailing list to be the first to hear about new calls for projects here. In January we will be inviting applications from local organisations for projects that will promote entrepreneurship to local people and support local businesses in the CLLD area to grow through tailored business support. If you would be interested in finding out more and being invited to the information session for this call, please send us an email with a short introduction to your organisation and your project idea. We now accepting applications for North of Tyne CLLD funded projects. In this round we are asking interested groups to complete an Expression of Interest (EOI) rather than moving to a full application straight away. We have made this change as we realise completing a full application can be time consuming and sometimes quite complicated if you are not used to completing European Funding Applications. Projects successful at the EOI stage will be invited to completed a full application. We have a full programme of support available including group sessions and 1-2-1 advice. To find out more check out the apply page of the website. Applications for the Round 1 call are due in by 3/2/18 and we are now looking ahead to Round 2 which opens in May. Before then we want to recruit some new members to the Local Action Group. - Rob Hamilton, Principal Economic Advisor, Newcastle City Council who spoke about the North of Tyne CLLD and Inclusive Growth. Round 1 of our CLLD progarmme is now open! Please go to the section 'Apply' to download the Application Pack. Come and join us on Tuesday, 28 Nov 2017 at the Urban Sciences Building, Newcastle University, Science Central to celebrate the launch of our CLLD programme. You will get information about the application process, timeline, funding requirements, output definitions, monitoring and payment process. You will also find out about becoming a member of the Local Action Group to help steer the programme in future and work with Open Lab to develop innovative ideas. Book your place here! After the summer break we have arranged our next CLLD workshops in September. We have booked three workshops in different venues and at different times/days to try and accommodate as many people as possible. If you are interested in finding out more book a place today! We've had a great response to the sessions with Blakelaw filling up fast, so please consider booking one of the alternative sessions if you are available on more than one date! If you need more information, please contact Victoria Powell, CLLD Community Engagement Officer at Victoria.Powell@newcastle.gov.uk or 0191 277 3598. Fantastic news! The ERDF and ESF funding have been approved in principle! We still need to meet a few pre-contract conditions and receive and sign all the paperwork before we can launch our CLLD but it looks like it's happening!!! While we are still awaiting confirmation of funding for our CLLD project, we are starting conversations with local groups and projects about the upcoming CLLD funding opportunities. The first workshop will take place on Friday, 28 July 2017, 10am - 1pm at Building Futures East in Walker (White Street, NE6 3PJ). If you would like to book your place, please e-mail Francesca at Francesca@buildingfutureseast.org by Friday, 21st July 2017. If you cannot attend, don't worry. This is just the first event of that kind and there will be plenty of opportunities in the summer and autumn to attend CLLD workshops and events. The closing date for new Local Action Group members was 1 February 2017 and the applications are now being processed. We hope to be able to announce the new members by the end of February 2017. The full applications for ERDF & ESF funding were submitted on 31 January 2017 and we are now a waiting approval to allow this project to start delivering in 2017. Until then we will carry out preparatory work with the new Local Action Group to develop project calls. If you are thinking about joining the Local Action Group, drop in for a chat and meet some members of the Group. They can answer your questions and help fill in the Application Form. No need to book, just show up. Click here to view our recruitment video. We are recruiting new members of the Local Action Group! We are looking for up to 6 people who live, work or volunteer in Newcastle or Wallsend to join the Group from spring 2017 and help with meetings, sub-groups, project selection and making local links. If you are interested, please go to 'Local Action Group' section of this website to find our more. Fantastic news! North of Tyne CLLD Strategy has been approved by DCLG (Managing Authority for ERDF) and DWP (Managing Authority for ESF). We have been invited to submit final applications for funding from ERDF and ESF by 31 January 2017. The preparatory phase of our CLLD Strategy is over! The Local Action Group, following the summer filled with gathering socio-economic data and meetings with local communities and businesses, finalised the Strategy! It was submitted to Department for Communities and Local Government (DCLG) and Department for Work and Pensions (DWP) on 31 August. They are the Managing Authorities for European Regional Development Fund (ERDF) and European Social Fund (ESF) and they will decide if we receive funding for the delivery of our Strategy.